Marking the French Social Revolution of '68 Forty years ago, millions of French workers joined protesting students in a general strike that paralyzed the country and nearly brought down the government. A few weeks later, the May 1968 protests fizzled out, but French society was radically changed. 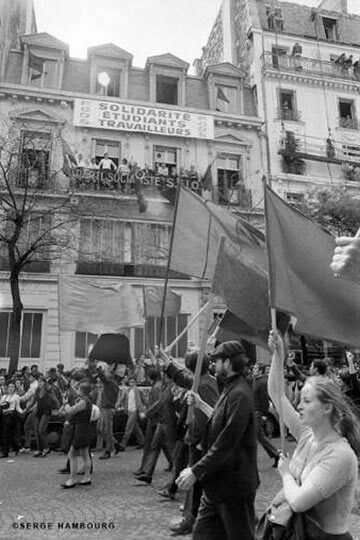 Students march in the streets of Paris in May 1968. "Everybody [had] some complaint against the government," photojournalist Serge Hambourg says. 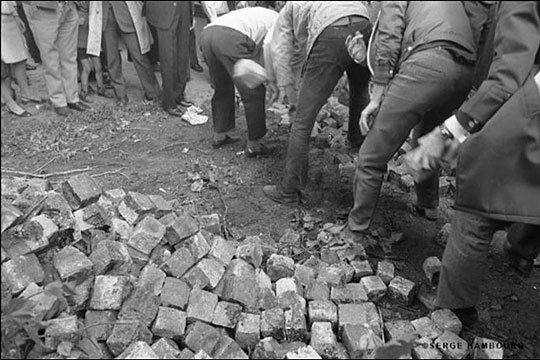 Students dig up cobblestones to throw at police. The layer of sand below the stones led to the slogan, "Under the cobblestones, the beach." Students built barricades during the protest. Hambourg purposely didn't take photos of their faces so they could not be identified later. 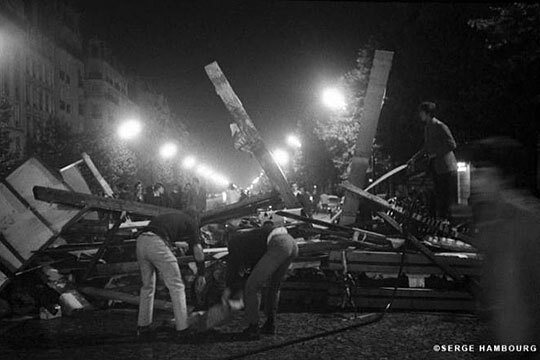 Photographer Serge Hambourg used his camera to capture the Paris riots in May 1968. Now 40 years later, those photos are part of an exhibit commemorating the riots. Student leader Daniel Cohn-Bendit raises his arm for silence to allow poet Louis Aragon to talk to students on a megaphone. Courtesy of Constantin Deliyannis/Le Hall de Chanson and 20 Years of French Modern Songs. 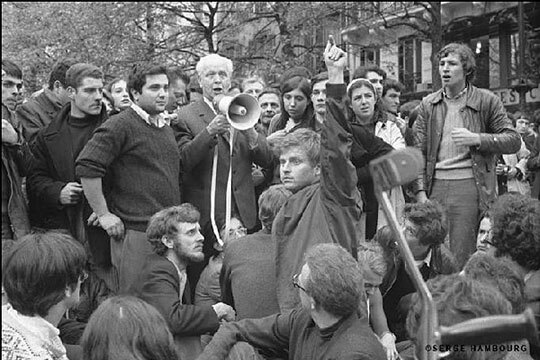 European Green Party deputy Daniel Cohn-Bendit was a sociology student at the University of Nanterre when he became leader of the student protesters during the May 1968 movement in France. He was known as "Dany le Rouge" or Dany the Red. 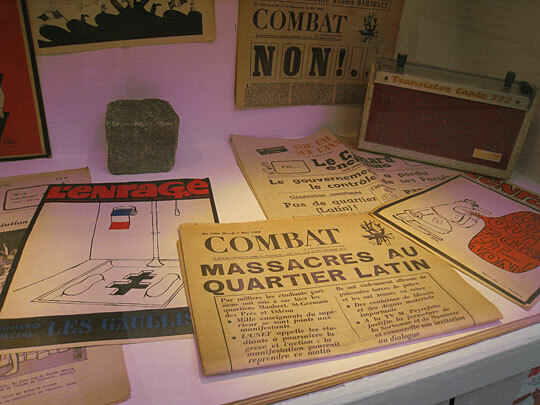 An exhibit in the 18th district of Paris displays some of the posters and newspapers from May 1968. Forty years ago, millions of French workers joined protesting students in a general strike that paralyzed the country and nearly brought down the government. A few weeks later, the May 1968 protests fizzled out, but French society was radically changed. Campaigning for president last year, Nicholas Sarkozy blamed the legacy of 1968 for leading to intellectual and moral relativism and hedonistic individualism. French TV was on strike for most of May, so the story was told in pictures and radio reports. 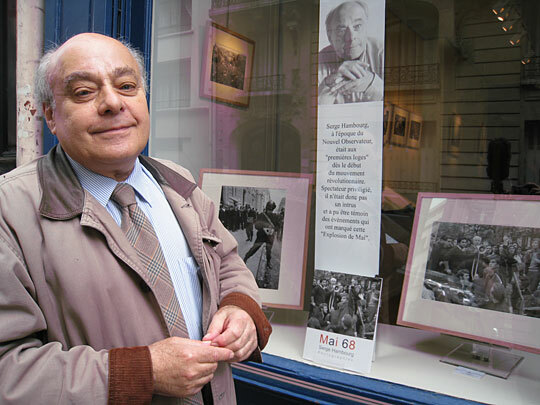 Serge Hambourg, then a young photojournalist, covered the protests from the start, in early May, when students occupied Paris' hallowed Sorbonne University on the Left Bank. His camera captured a fast-forward transformation. In the early shots, students clashing with police wear jackets and ties and have short haircuts. In the later ones, students have beards and wear sandals. He points to a picture of young men building barricades and ripping up cobblestones, assisted by local residents. "It was so exciting and everybody has some complaint against the government, so everybody has reason to complain and to fight — a worker, a student, a old guy, a young guy," Hambourg says. In May 1968, Charles de Gaulle was France's paternalistic president. He ruled over a newly prosperous but rigidly conservative society. Women couldn't wear pants to work and married ones needed a husband's permission to open a bank account. Homosexuality was a crime. Factory workers could be fired at will. The news on the single TV channel required government approval. And the overcrowded educational system was authoritarian. Postwar patriarchal France was unprepared for the onslaught of the baby boom generation. Kids challenged an uptight society to become modern and democratic. Society responded with collective self-examination. In those weeks of May, 40 years ago, the Left Bank became one large debating society. It was a moveable feast of talk. The center was the Grand Odeon theater, whose director, the legendary actor Jean-Louis Barrault, threw open the doors for open-ended discussions. And everyone took the stage: agitating students, sympathetic local residents and celebrated intellectuals, curious tourists, striking workers and idled managers of occupied factories. For a brief moment, utopian dreams and political action merged seamlessly into the joyful pleasure of living life to the fullest. 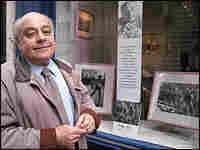 "Our generation enjoyed an unprecedented optimism," says Henri Weber, a Socialist member of the European Parliament. "We were promethean." Four decades ago, Weber was on the barricades. He says no one knew what unemployment was. His generation believed in the anti-colonial movement and the technological revolution. "We experienced utopia, a moment where everyone could live a full and intense life," Weber says. "The watchword was live without pause, enjoy pleasure without restraint." The streets that saw running battles between police and students are now dotted with Starbucks and McDonald's. Many small radical bookshops have been replaced by trendy designer boutiques. "Marxism, Groucho Version," "Be Realistic: Ask for the Impossible" and "Under the Cobblestones, the Beach." In all the photos, in all the radio reports, men took center stage. Anne Zelinksy, then a student at the Sorbonne, was annoyed that women's issues were ignored. With a friend, she organized a debate on "women and revolution." "We were sure no one would come and were so nervous we held hands under the desk to give ourselves courage," Zelinksy says. "But the huge hall filled up, people stood in the aisles, and everyone talked and talked for hours about everything — all the sexual taboos. There was an extraordinary need to speak. It was my encounter with history." Ten years later, Zelinsky was a founder of the French women's liberation movement. The most important achievement of May '68, she says, was that it led to equal rights between men and women and legalization of abortion, giving women control over their bodies. May 13, 1968, was a turning point. Slogans turned more political as millions of workers put down tools in solidarity with the students and marched in the streets of Paris, singing the communist anthem. It became the biggest general strike in French history and, to de Gaulle's horror, brought the country to a halt. While rumors of a coup d'etat circulated, authorities secretly negotiated with unions, granting unprecedented wage hikes and benefits. On May 30, a massive pro-de Gaulle counter-rally was staged on the Champs-Elysees, on the Right Bank, far from the scruffy tumult of the Latin Quarter. By mid-June, life returned to normal. What's been called the French psychodrama has entered the realm of myth. 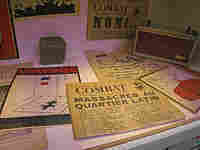 Paris' 18th district is commemorating the events with an unusual exhibit. Visitors wander through a mock-up of a typical '60s working class apartment — complete with Formica-topped table and then-newly available appliances such as vacuum cleaners and transistor radios. Those nostalgic for the music of the times can pick up headphones and listen to the protesters' favorite, "Paris S'eveille," or "Paris wakes up." "I wanted to show it in music, that the values of '68 — of just wanting to change the world, of freedom — are still here today," says Marie Claude Audigier, the exhibit curator. Sociologist Jean-Pierre le Goff dismisses the legacy of '68 as "narcissism and cynicism," saying, "We have lost a sense of collective responsibility." Jean-Luc Hees, author of a book about 1968, says many French right-wingers are fed up with that year's events. "They say, 'Thank you so much for May '68.' We have to clean up after you. You had no worries; we have lots of worries. You had no AIDS; we have unemployment, it's a bankruptcy here. You had your time, you had your pleasure, and we have the leftovers and this is not so great.'" Yet, even conservatives acknowledge that in just four weeks, France underwent a radical political and cultural revolution — and not one person was killed. No Western country experienced so much change, so much emancipation so quickly. An archaic society was swept aside. All institutions were transformed: the workplace, the university, the family and the couple.